- Control your heating with the tado° Smart Thermostat from everywhere and anytime - via app, tablet and PC. 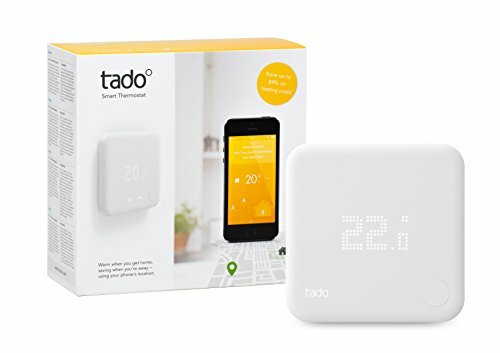 tado° pays for itself within the first year. - The wireless thermostat automatically cuts your energy bill up to 31% using your phone's location, weather forecasts, Open Window Detection and integration of building characteristics. - With multi-room control you can save even more on your heating costs and make life more comfortable. - Works with 95% of heating systems. Box contains: Smart Thermostat, Internet Bridge, free app (iOS, Android, and Windows), installation accessories.